Beklager at gårsdagens blog ikke kom ut til vanlig tid, men vi var utenfor mobildekning og jeg fikk ikke til å sende med satellittelefonen - selv om det fungerte helt perfekt for noen dager siden. Nattseilasen som tok 18 timer gikk ganske bra - vi hadde måneskinn mesteparten av natta og kunne følge med på lysene fra byene langs land og fyrene. Det var mye morild i sjøen som skapte hundrevis av lysglimt i sjøen der båten hadde rotet opp vannet. Vi brukte motoren til motorseiling ca. tre timer på turen der vinden kom for skarpt inn for å kunne stå kursen. Etterhvert kom vinden mer fra vest og vi hadde bra bør rundt selve Land's End. Man blir ganske trøtt av slike turer, og det var deilig å droppe ankeret utenfor havnen i Penzance kl. halv åtte, og legge seg under dyna noen timer. I skrivende stund ligger vi fortsatt for anker og venter på at slusene til havnen skal åpne. De åpner fra to timer før høyvann, til én time etter høyvann (som er 15:24 lokaltid). Alternativet var å ligge i fiskehavnen like ved - men her er det ikke tilrettelagt for fritidsbåter og det så litt industrielt ut man mange fiskebåter og dårlige kaier. Nå er vi kommet inn i havnene i Penzance, etter en liten seiltur over til Mount St. Michael - en slott på en øy like ved Penzance. Det går en vei over til øya ved lavvann, men man kan seile over veien ved høyvann! Stedet er under restaurering for tiden så det er en del stillaser osv på bildet. Havnen her i Penzance er ganske så trang - delvis fordi en større militærbåt opptar halve gjesteplassene, så båtene som er her ligger nå seks dyp og med tauverk i land og til hverandre som ligner spagetti (se bilde)! Vi tok en liten tur inn til byen, som virker sjarmerende og koselig, men tok oss ikke tid til å utforske hele stedet med en gang. Vi blir her noen dager så det haster ikke. Vi skulle bare ut for å handle lit hostesaft til Rønnaug som har fått vondt i halsen. Apologies for yesterday's blog not coming out until the small hours of this morning, but I couldn't get the satellite phone and PC to work together - despite it all working fine just a few days ago. I'll have to spend more time looking at this - but when at sea it is not appealing to sit below concentrating on some stupid computer problem as the boat is tossed around by the waves. We had a pretty good night sail (18 hours in total) - mostly clear skies and plenty of moonlight. The sea was full of phosphorescence - hundreds of tiny light dots lighting up in the wake and disturbed water around the boat. The wind was mostly OK - we used three hours of motor to motorsail in places where the wind was too sharp on the bow to let us stand our course. The wind became a little more westerly as we approached Land's End, and we had a good sail here and after rounding as we then got the wind from behind us. Night trips are always a bit of a killer - sleep is not easy on the off watches, though I managed to get away a bit. It was nice to drop the anchor outside the harbour at Penzance at seven thirty this morning and get under the duvet for a few hours. 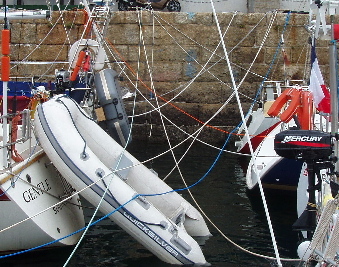 I am writing this first part of the blog as we lay at anchor - the lock into Penzance harbour opens from two hours before High Water, to one hour after HW, so we have a bit of a wait (HW is 15:24 local time). Now we have got into the harbour at Penzance, after a short sail trip over to the famous Mount St. Michael (the French have one too) - a castle on an "island" with a causeway flooded at hig tide. There is clearly some restauration work going on as the place was largely covered by scaffolding (see picture). After that it was time for the lock to open into the harbour, we entered with some other boats. Although there is normally reasonable space here, a navy vessel is taking up half of the available room for yachts, so we are rafted up six deep in the remaining space. The ropework gonig from the boats to land and between boats looks like spaghette (see picture) . The navy boat will go on Monday so we should get better room then. We will stay here at least three days - there is a pay two nights, stay for three deal here which we will utilize. There is also some strong wind forecast (and blowing at the moment), so we will be staying put here until better winds for thecrossing to France arrive. We walked into the town - charming place - to buy some cough mixture for Rønnaug who has a bit of a throat at the moment. We will leave the full exploration for another day.